As I said last week, the CASE Board of Directors will be meeting in Atlanta this Wednesday and Thursday to learn more about CASE, help shape the direction of CASE, share the great work being done in the state and provincial units, and problem solve the big issues we all face on a daily basis! I remember my very first CASE BOD meeting in San Diego, California, in 1992; I was in awe of all the leaders in the field gathered in one large room. I thought to myself, there isn't a problem in the area of special education that these people couldn't solve! At the time I was the president elect of Georgia CASE and our unit had made a commitment to always send the president and president-elect to the CASE BOD meeting. It was an amazing meeting where some significant changes were made due to the input of those in attendance. The direction of CASE can only be better when you have the input from that many different leaders from so many different locations! I am always so excited as the fall meeting gets closer and then finally arrives but this year I am even more excited! The CASE Board of Directors will be meeting in MY HOME TOWN, Atlanta. If you know much about Atlanta, you know not many people were actually born there — it is a city made up of people from everywhere! And in all honesty, I don't live there anymore but I was born there. In fact, I was born only a few blocks from the Atlanta Hyatt Regency. Did you know the Atlanta Hyatt Regency was the first Hyatt with the open atrium? And did you know at one time it was the tallest building in Atlanta? My sons tell me I should not tell people that I remember when that was true but really, it wasn't THAT long ago! We will have 32 out of 40 unit representatives and one state that is considering becoming a CASE affiliate in attendance. Watch the CASE Facebook page for the pictures and discussions held during the BOD meeting. Also watch Twitter for additional information — #case2015ATL, don't tweet, you can follow the Tweeting conversation by going to the CASE website and scrolling down on the homepage — let's get talking so we can make a difference! Speaking of keeping the conversation going, it isn't too early to start planning for the CASE Hybrid Conference! Last week I inadvertently led you astray on the topic of one of our Hybrid days, Thursday with Dr. George Batsche. Dr. Batsche will not be talking about MTSS but rather I hope you have marked your calendars for Feb. 11-12 and are planning on registering to either be a virtual site for the CASE 5th Annual Hybrid Conference or come south and spend a great few days at the Beau Rivage in Biloxi, Mississippi! As a virtual site, you will have a great opportunity to invite other stakeholders to participate with you and your team in a cutting edge, live professional development event designed to promote student achievement in your school/district/region! The theme this year is DATA DRIVEN ACCOUNTABILITY: Actualizing the Promise through Practice. 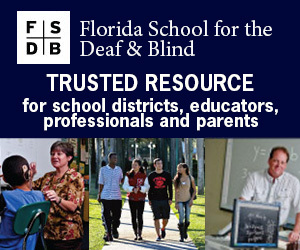 The dates are Feb. 11-12 with Thursday being led by Dr. George Batsche: Actualizing the Practice- LD Eligibility Under an RtI Model (LD Toolkit) and Friday being led by Julie Weatherly, Esq. : Legal Issues: Actualizing the Promise. You can have as many people in the room as you wish all for one low price of less than $500! Watch for registration in the next few weeks on the CASE website. Of course, if February is too cold for you, we would love to have you join us onsite for the Hybrid at the lovely Beau Rivage hotel in Biloxi, Mississippi! And with room rates of just $109, bring the whole family for a winter break! And speaking of great professional development! Have you been checking out the bimonthly links from the Building and Sustaining Student Engagement out of the University of Nebraska, Lincoln? There is a new one every two week. For the last two weeks it was about Staff and Student Relations. For the next two weeks, it will be on the very elusive, Motivation! See the article below and be sure to check these out every other week or maybe you should check every week just to make sure you don't miss anything! 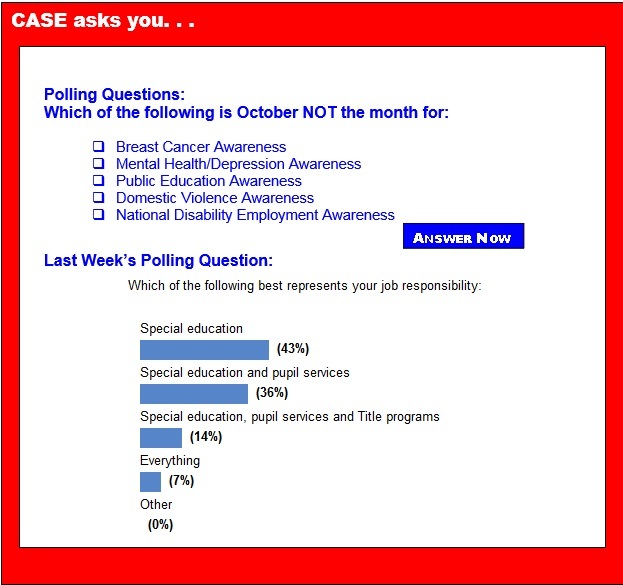 Last week, the Poll dealt with your job responsibilities. We didn't have a lot of respondents this week so not sure what that says but I would once again ask you to send me your suggestions for poll questions! Of those answering the poll, there was a clear first place at 43 percent for special education; second place was 36 percent both special education and pupil services: third place at 14 percent was special education, pupil services and Title programs. Coming in last at 7 percent was everything. I have to tell you I was a little surprised at how few responded to everything! Maybe things aren't as bad as they had gotten a few years ago when if someone left, their job didn't get filled, just handed over to someone else, usually the special education director — who better?! Thanks for all you do every day for so many! As part of our celebration of 40 years of the Individuals with Disabilities Education Act, we want to hear from individuals with disabilities — especially children and youth with disabilities — parents, teachers, researchers and all other IDEA stakeholders about the personal impact this law has had on them. How has IDEA made a difference to you? What do inclusion, equity and opportunity look like for you? Share your art, photographs and stories by Nov. 6, 2015 to our IDEA 40th Anniversary website for possible use for upcoming events in Washington, D.C., celebrating the 40th Anniversary of IDEA. Please send any questions to: IDEAanniversary@air.org. 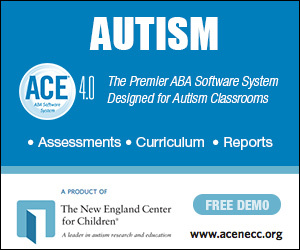 Do ADHD students qualify for special-education accommodations? How can we teach math to encourage 'patient problem solving'?